Ladies and gentlemen, boys and girls, Doom is here. That’s right folks, not content with assuming Tony Stark’s position as Iron Man, Victor Von Doom has now seen fit to join the Avengers. Or more accurately, have them join him and in Secret Empire he not only recruits them to his cause, but also returns to save the day when one of the Avengers oldest, not quite forgotten by everyone, enemies returns to the fray seeking more than a modicum, and her fair share, of vengeance. Because that’s what the super-villains of yesterday still insist on doing. They want revenge on the heroes who humiliated, beat and stopped them in their tracks and instead of using their incredible powers to pull off a series of get rich quick heists and then use the proceeds to buy a Caribbean island and retire in luxury, they get stuck in an endless loop of defeat after crushing defeat and refuse to learn the principle law that governs everything in their corner of the multiverse. That eventually the good guys always win. 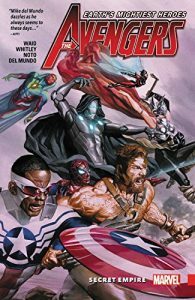 Okay, so the returning foe chapter of Secret Empire is a massive cliché, but in the hands of Mark Waid and Jeremy Whitley, it’s a thoroughly entertaining one. And who doesn’t like Doom’s bad guy doing good thing?. Nobody that’s who. Everybody likes it and it never gets old. *Straight from the Stan Lee school of alliteration.